“X” is the mark of death for trees in the city. The city is taking down trees that have caused sidewalk slabs to buckle, and that has some folks upset. Normally, our editorials are placed inside this newspaper, but there is one issue that we feel so strongly about, it deserves front-page attention. As regular readers know, there is a sidewalk improvement project underway. Unfortunately, that also means the city is taking down dozens of healthy trees because they are causing sidewalk slabs to buckle up. And sidewalk slabs that are uprooted cause people to trip and fall, and they in turn sue the city. While this poses a serious financial threat to the city, we urge city leaders to halt this program. Some of these trees are 80 to 100 years old, and they provide much needed shade and beauty in our neighborhoods. People are beginning to scream about this. But there is a problem. There is no leadership in City Hall. None of our elected officials have stepped forward to put a stop to the removal of these trees. Instead, there is a grassroots effort to halt this madness on Facebook. Problem is, though, Facebook rantings won’t solve anything. It takes real leadership. We believe there are a number of alternatives to taking down trees. The city needs to take a step back and get creative. 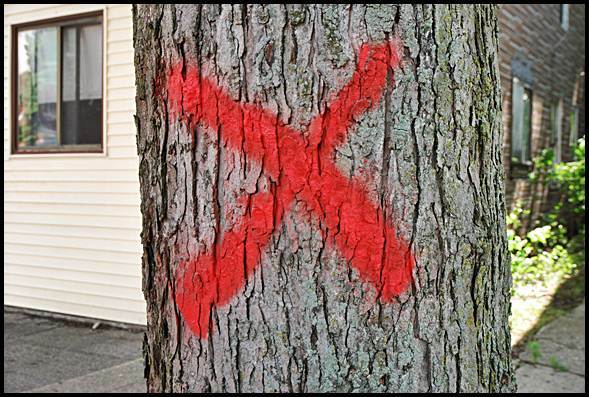 It also concerns us, and we’re just going to say this, that the person who is marking the trees for removal is a former employee of the company that the city contracts to take away the trees. We’re going to guess that it costs about $1,000 a tree to remove and grind the stump. There are 40 to 50 trees designated for removal. You do the math. All available alternatives to cutting down trees should be used. The city should be looking at how to save the trees and make the sidewalks safe if possible. In such an urban environment as Hamtramck they are vital to the quality of life and aesthetics of the city. I think a full investigation into what happened is certainly called for and whoever responsible for any wrongdoing held accountable.